Last year November 17 ’18, major currencies such as the Euro and Cable both triggered weekly bullish regular divergence. Although the GBP experienced more volatility which was mainly due to speculation on Brexit, the Euro on the other hand maintained a calm outlook trading within a range. Join us this week as we look into the important technical and fundamental events that are responsible for the price direction of the EURUSD. On Monday this week, Mr Draghi gave a press conference on the ECB observation of the European economy. A hawkish outlook is often considered to be positive for the Euro, however, a dovish outlook is regarded as bearish sentiment. Other important fundamental announcements to look out for are the EMU Gross Domestic Product on Thursday, whereby the previous outcome was 312K and consensus is at 168K. We are looking forward to high volatility this week as bunch of medium and high impact news announcements are scheduled for release such as the U.S Consumer Confidence; The S&P/Case-Shiller Home Price Indices; Fed Interest rate decision; Friday FOMC Press Conference, Average Hourly Earnings, ISM Manufacturing PMI, and the U.S Nonfarm Payrolls. The most significant that we believe traders should look out for due to the volatility they bring, are the last five. The Federal Reserve’s board of Governors holds an economic policy meeting to decide interest rates on loans and advances to commercial banks. A hike in rates often boosts the dollar as it is usually considered a healthy inflation, on the other hand, a cut in rate is often interpreted to be woes of inflation. The previous result of the Interest rate was at 2.5% and the consensus is expected to be at the same 2.5%. From a monthly chart view, price trades within the high-low range of 1.15001 and 1.12154 of November 2018. The subsequently triggered bullish accumulation pattern triggered after the closing price of December 2018 has maintained a support at 1.12695, after a price slump from the failure of hidden bullish accumulation on 02 April ’18. At this point, the bulls are on the verge of establishing further territories towards the up side. Only a breakdown of the 1.12154 support will validate a follow-up of the downtrend. A view from the weekly chart presents a fresh dynamic towards the formation of the price pattern. Starting from a bearish accumulation formed on November 5 ’18, and October 29 ’18, price has not been able to violate either of these levels (1.13019 and 1.15001) by a bearish closing bar. These are strong support and resistance levels that can be used to take call or put binary options trades on Nadex , as price is seen to be either overbought or oversold from these levels. 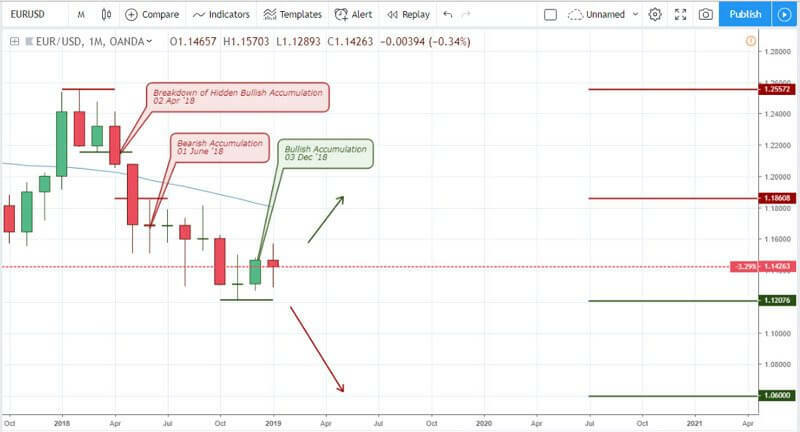 A bullish accumulation pattern triggered on December 24 ’18 aligns with the bullish accumulation pattern on the monthly chart and both combine to announce the resilience of the bulls in the market. The bullish accumulation sets up a support level at 1.14439, a level price has not yet been able to close beyond. Also supporting the bulls is the bullish regular divergence pattern triggered on December 17 ’18. Although there are more signs of price moving higher from the weekly chart, we should not ignore a buildup of a possible bearish hidden divergence. 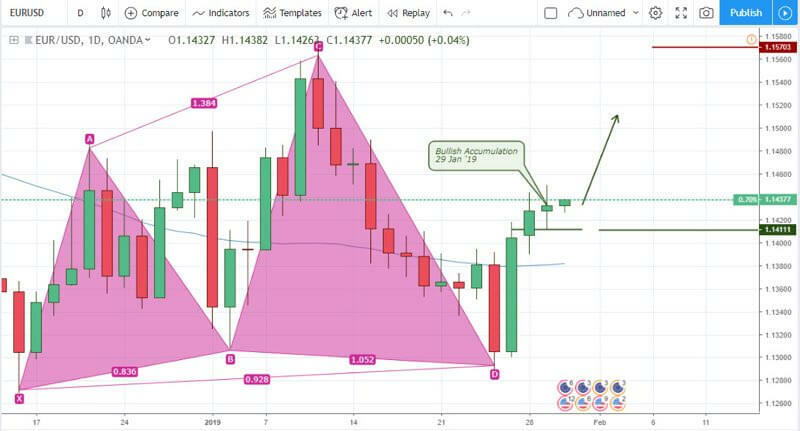 By selecting a candle stick chart preference from any binary options broker of your choice, and scrolling down to the 4hour chart, one cannot deny the opportunities of entering on a short trade first from a failure of hidden bearish accumulation on 24 January ’19, 06:00. An opposite long trade is triggered by a bullish accumulation on 24 January ’19, 22:00. The bullish pattern resulted in an increase in foreign exchange of the Euro by 1.12%. 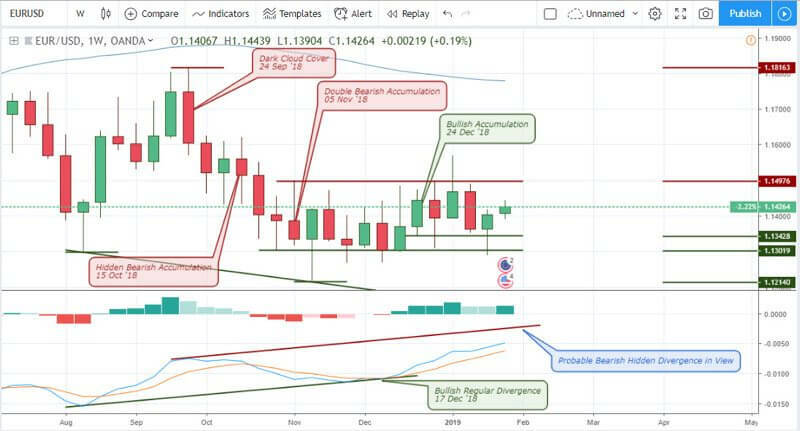 From the above considerations of technical and fundamental events analyzed, we look for further increase in the exchange rate of the Euro as the daily chart recently triggers a bullish accumulation prior to publishing this post.